A new business e-publication for tablet and smartphone users is being launched today by Trinity Mirror. “This new digital publication is a very exciting step for us, keeping our brand at the cutting edge of the news industry in our third century of publication,” said Mark Thomas, editor of the Liverpool Post, who is also editor of the new Business Daily. “We have expanded our award winning business team to deliver a richness and depth of business coverage that I think will be unrivalled in any regional city. The format allows us to deliver multi-media packages, with video, audio, picture galleries and archive material to enhance our stories. They've taken on 5 new members of staff to produce the paper, taking the total headcount of the business team to 9. The launch has been timed to coincide with the newspaper’s Regional Business Awards, which take place at St George’s Hall this evening. Using a subscription model, the tablet edition will start at £9.99 a month on Apple and Android devices, although corporate subscriptions will be worked out according to how many are taken up by a company and the length of the deal. There will also be “bundle deals” for those choosing both the weekly print edition as well as the daily e-publication. 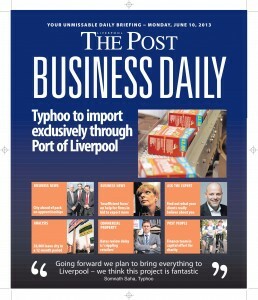 "Having worked on the Liverpool Post for several years, I know how highly-regarded the brand is, especially amongst the region's business community,” added David Higgerson, digital publishing director, Trinity Mirror (Regionals). "Like the Birmingham Post Business Daily, we have set out to create something which provides the business community with what they need every day: essential information about business which helps them to do their jobs and take their businesses forward. "There simply isn't anywhere else where people can get such an essential business briefing, waiting for them on their tablet, or on their desktop, as soon as they get up in the morning." Features within the app include a Leads and Deals section with tender opportunities, planning applications, mergers and acquisitions, insolvency alerts, executive jobs and news of key appointments and moves in the business community.